If you enjoy your breakfast with a side of restless dread, you should pick up a copy of the remastered Perfect Blue vinyl soundtrack. I say “breakfast” as that’s how my first listen went; a dark January morning over a bowl of New Year’s Resolution, with the film’s songs of madness accompanying my soggy bran and skimmed milk. Another creation by retro OST powerhouse Tiger Lab Vinyl, Masahiro Ikumi’s eerie soundtrack of Mima’s conflict against her idol-self seems perfect for the turntable, evoking as it does the heyday of Japan’s controversial idol culture in the 1970s and 1980s. If you’re a Japanese music buff, it’s hard not to think of the hardships faced by the legendary Momoe Yamaguchi or Seiko Matsuda when you listen to the soundtrack in all its ghastly glory. But even if you’re simply a fan of Perfect Blue it’s clear the emphasis is on the darker, more sinister side of the entertainment world that Satoshi Kon explores onscreen. Perhaps that’s why the decision was made not to include the music performed by Mima’s idol group Cham! on the vinyl itself – as with the original CD release, these tunes are missing. They’re upbeat, happy j-pop songs in stark contrast to the core of the movie, and while they do work to bring the idea of fixed idol and fluid actress to life I don’t think that would come across in isolation. What we’re left with instead is the score that accompanies the film’s descent into illusion and insanity. 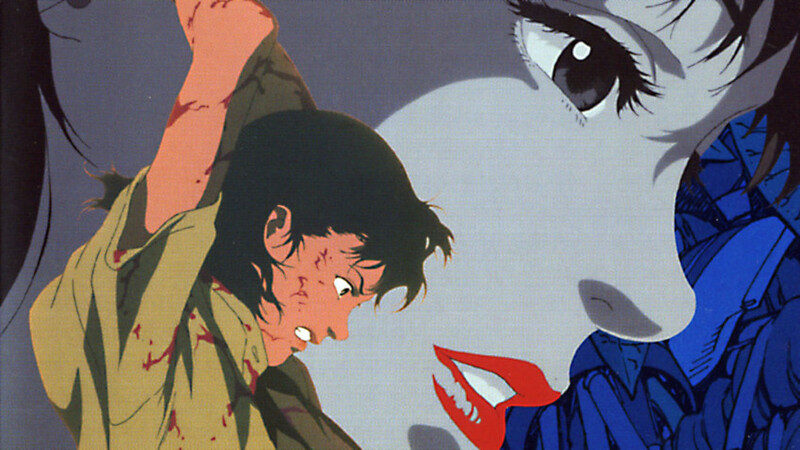 As a standalone soundtrack it’s powerful, moody and probably altogether unsuitable for easy listening – honestly, don’t put it on when you’re in the house alone – and whether or not it was intentional, the record captures Satoshi Kon’s intensity so well it’s almost criminal he and Ikumi never collaborated again. The vinyl itself is a beautiful collector’s piece that follows the menacing appearance of the Perfect Blue collection, with the transience of Mima’s world reflected wonderfully in the gatefold packaging. Probably my favourite aspect of it is the record, made from a vibrant marbled material that spins on the turntable in a particularly psychedelic way; it’s very easy to spend the entire track listing (which is fairly short at 31 minutes) staring at the shapes it makes as the needle moves. In case the prospect of US shipping sounds more nightmarish than the music, Tiger Lab have teamed up with Zavvi to offer a special limited edition version of the vinyl in the UK. Apparently a UK-only exclusive, it uses a clear variant material that definitely looks better than the original blue version once it’s out the packaging. Limited to 500 copies, it’s been out a few weeks already so if you’re keen to get your hands on an unusual piece of merchandise it’s probably best to get your hands on this now, as the guys at Tiger Lab aren’t known for reprints. The limited edition Perfect Blue OST vinyl is available now from Zavvi in the UK. I was kinda disappointed that Angel of Love wasn’t included on this release, I realise there’s quite a stark difference between it and the rest of the soundtrack but with what takes place during the elevator scene I thought it would be nice to have included it. Either way I’m just glad to have it alongside your release of the very nice collectors edition Blu Ray.